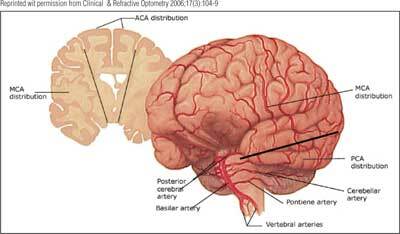 Main trunk occlusion of either side yields contralateral hemiplegia, eye deviation toward the side of the MCA infarct, contralateral hemianopia, and contralateral hemianesthesia. Eye and head deviation toward the side of the lesion is probably due to damage of the lateral gaze center (Brodmann area 8), or it can represent classic neglect, particularly when the right MCA is involved. Trunk occlusion involving the dominant hemisphere causes global aphasia, whereas involvement of the nondominant hemisphere causes impaired perception of deficits (anosognosia) resulting from the stroke and more qualitative deficits of speech (see Left-hemisphere (dominant) infarction, below). Superior division infarcts lead to contralateral deficits with significant involvement of the upper extremity and face and partial sparing of the contralateral leg and foot.